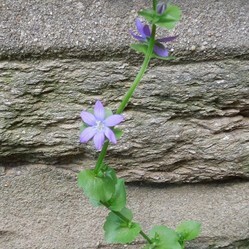 Clasping Venus' looking glass, or Triodanis perfoliata is an annual flower native to Eastern North America with small, distinctive leaves, and a cute purple blossom. Clasping Venus' Looking Glass, scientific name Triodanis perfoliata, is an annual flower that is able to grow in very poor soil. It is an incredibly cute plant, with interesting-looking foliage before it blooms. It tends to bloom around early summer, and its blooms are a beautiful purple color, although they are very small. This plant is native to Eastern North America. If conditions are right, it will thrive on its own with little care, but in areas with richer soil or less sunlight, it will be choked out by other plants. It is sometimes considered a weed but I find that silly; it is not the most vigorous plant and it usually adds natural beauty in barren spots where little else will grow. I find this plant is distinctive and easy to visually ID once you see it. The leaves are round, serrated, without leafstalks, and clasp the stem in a distinctive way. The flowers are violet to blue colored; they typically have 5 petals but can have 4-6, and my experience is that the number of petals varies much more than is typical among plants. The stem is trailing and usually does not branch, but it becomes more likely to branch if cut, and sometimes multiple trailing stems will grow from the base of the plant. Flowers are nestled singly in the leaf axils, where the leaf meets the stem. Flowers are followed by small seed pods which contain tiny seeds. The flower usually has five petals; this one I found in my yard had six, and one flower on the plant only had four. This plant actually requires poor soil, or else it will be choked out by other plants. Triodanis perfoliata grows in a variety of different habitats, but it has a strong preference for disturbed habitats with poor soil. It often is found on weedy areas, such as along gravely borders in urban areas. It can be found locally on nutrient-poor sites in open, dry woods as well. I've found it growing in clay soils as well. Although it seems to prefer dry areas, I think this may be more due to competition from other plants, as it seemed to do fine in a wet year. The main thing that will limit this plant's ability to thrive is competition from other plants. It survives where many other plants cannot, but in soils rich enough for other plants to get a foothold, it will easily be choked out. It does not need full sun; I've seen it thrive in an east facing exposure, between two buildings, with only a few hours of sunlight during the heat of the day, but it does seem to need direct sunlight; scattered light filtering through other plants will not be enough for it. This species' preferences make it an ideal choice for growing in gravely borders, bare areas, and up against buildings or stone walls. The slightly vining habit allows it to take root in a small patch of soil and then grow out to a sunnier spot where there is little or no soil. Look closely at this plant to learn its leaf shape and growth habit, which are distinctive. Leaves clasp the stem and have no leafstem. The plant's main stem is usually unbranched, but many stems often grow from the plant's base. According to UMass Amherst's page, this plant can grow both as a summer or winter annual. It rarely survives as a perennial; usually, the plant dies down each year, and a new generation comes up from seeds. Blooms are usually in early summer, and blooming lasts for about a month...the plant blooms sequentially, usually opening one or two flowers at a time, closing flowers lower down on the stem, and then progressively opening new flowers higher up on the stem over time. The lower part of the stem houses self-pollinating flowers, which do not open, but will form seeds. Seeds are tiny. This species is named for a related European species, whose seeds have shiny centers, giving them the appearance of miniature mirrors. This feature is not typically visible on this species however. The seeds are borne in small seedpods, and are usually dispersed by wind. Unlike some wind-dispersed seeds that come with something feathery and light attached to it, these seeds are dispersed merely by virtue of the fact that they are so tiny that they readily blow around in the wind. If you have the right conditions for this plant, it will be able to come up year after year. However, in most natural conditions, its habitat is ephemeral: as nutrient levels build up, it is eventually out-competed by lush plant growth around it. Venus' Looking Glass - Triodanis perfoliata - Illinois Wildflowers - This page focuses on the state of Illinois but will likely be useful for people in a broader region as well. It describes the plant's growing requirements, faunal associations, and briefly discusses cultivation. Triodanis perfoliata - Lady Bird Johnson Wildflower Center - This site is based at the University of Texas at Austin, but has information on the species occurrence in all regions.